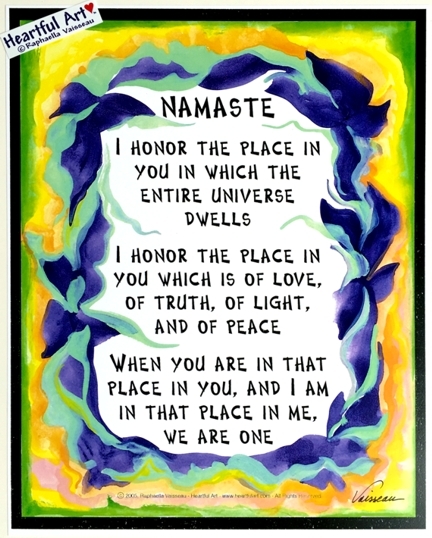 11x14 Namaste Poster by Raphaella Vaisseau - offering a blessing of oneness for us all. Namaste is a common spoken greeting or salutation used in India and Nepal. It has multi-religious or common usage where it may simply mean "I bow to you." In recent times the term "Namaste" has come to be especially associated with yoga, spirituality and meditation. Perfect for students and teachers of yoga to display in their yoga studios, and spiritual seekers of any persuasion. Also a great gift for lovers, friends, and spouses. Because it is complete with envelope, it may be mailed as a gigantic greeting card or given as a gift. 11x14 poster frames are inexpensive and readily available which makes it easy to frame as wall art. This listing is for the poster only. The Heartful Art information notice in top right corner is not on the actual poster.